Panicled Sumac is a shrub or small tree, 2-6 m tall; branchlets hairless, warty. Leaf-stalks are 2.5-4 cm, hairless, channeled above; leaf blade digitately 3-foliolate or rarely 5-foliolate; leaflets stalkless; leaflet blade oblong or inverted-lanceshaped, lateral leaflets 3-7 × 1.5-3 cm, at branch-ends leaflet 6-11 × 2-4 cm, papery, base broadly wedge-shaped, entire or shallowly wavy, tip blunt, lateral veins prominent on both sides. Flowers are borne in panicles at branch-ends or in leaf-axils, 12-20 cm, with many slender branches, yellow hairy. 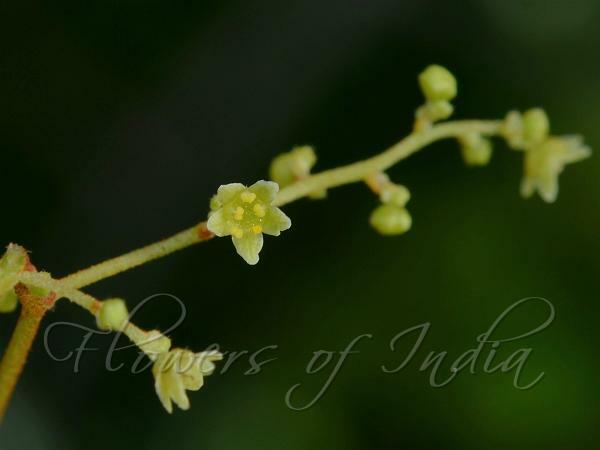 Flower-stalks are about 1 mm, minutely velvet-hairy; flowers light yellow, 4- or 5-merous. Calyx hairless, sepals blunt, ovate, about 0.5 mm. Petals are elliptic, about 1.5 × 0.8 mm, with feather-like venation pattern. Stamen filaments about 0.5 mm; anthers ovoid, about 0.3 mm. Disk 10-lobed. Ovary spherical, 0.5-0.8 mm in diam., hairless; styles 3, free; stigma capitate. Fruit is nearly spherical, slightly compressed, about 4 mm in diameter, exocarp orange-red at maturity, finally separating; mesocarp glutinous. Flowering: September-November. 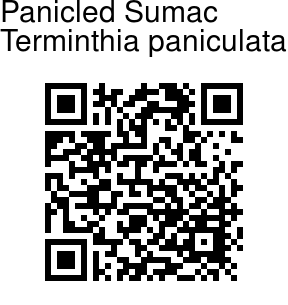 Panicled Sumac is found in Bhutan, NE India and Myanmar. Identification credit: Anurag Sharma, Tapas Chakrabarty, Arun Kumar N. Photographed in Turahalli, Bangalore.